The penultimate round of this season’s UAE Sportbike Series (29 March – 2013) will feature a very special participant, as one of the world’s leading Ducati riders, Dario Marchetti flies in to make his racing debut in the Emirates. Marchetti, a multiple championship winner around the globe, will take his place on the grid at the Dubai Autodrome in the 1000cc class, riding a 1199 Panigale R.
Multiple championship winner and head of prestigious Ducati Riding Experience, Dario Marchetti to race in penultimate round of 2012-2013 series. Dario’s entry, on behalf of Ducati UAE, will see him battle it out with current 1000cc championship leader, Saudi rider Abdulaziz Bin Laden. Bin Laden has enjoyed an impressive winning streak during the championship, emerging victorious in the past four races. The weekend’s racing will now pit Marchetti and his 1199 Panigale R against Bin Laden on his Honda Fireblade – a true battle of two of the world’s greatest superbikes. 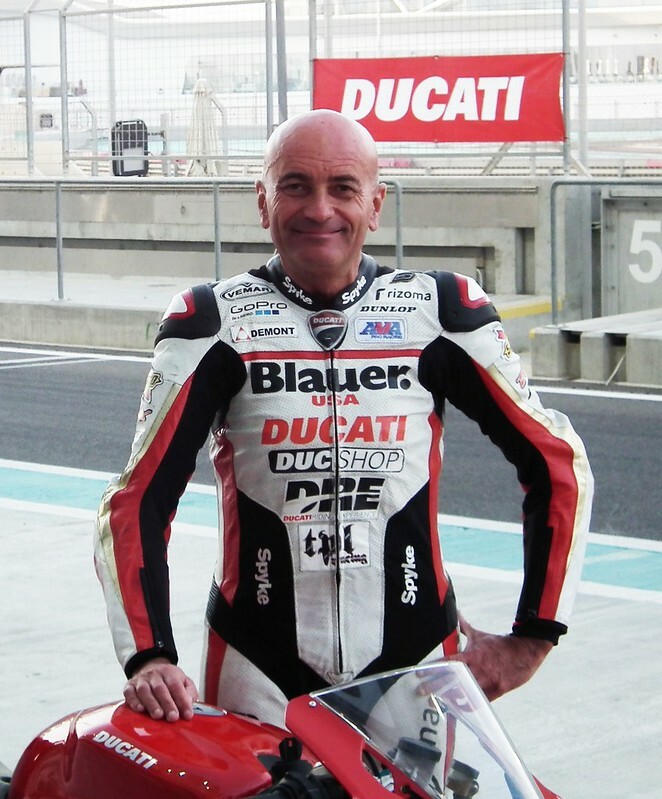 Marchetti is Chief Instructor for the Ducati Riding Experience (DRE), recently running two sessions at Yas Marina Circuit, the first time the prestigious programme was held outside Ducati’s base in Italy. The Italian has enjoyed a diverse racing career, ranging from 500 GP to Superbike races. His list of honours includes four national titles, the Italian Endurance Championship in 2001 on a Ducati 996R, the Battle of the Twins race at Daytona aboard a 748 in 2004 and the European Endurance Championship later that year riding a 998 and 999R. The 195hp 1199 Panigale R is the absolute flagship of the Ducati range. Special enhancement to the Panigale R by Ducati Corse, the Italian manufacturer’s motorcycle racing wing, make it the ideal machine for World Superbike homologation. By racing in the UAE Sportbike Series, Marchetti is aiming to demonstrate that Ducati’s flagship model is the best superbike on the market today. Like all the 2013 1199 models, the 1199 Panigale R is equipped with the latest generation engine mapping and Ride-by-Wire calibration, further enhancing the Ducati Superbike ride experience. As well as being the lightest motorcycle in its category, the flagship R model also introduces a race-oriented, 4-point adjustable swingarm pivot, titanium con-rods and a 500rpm higher rev limit (12,000rpm) in addition to a Race Kit of performance components, including a full Termignoni race exhaust system. Ducati UAE’s decision to enter Marchetti and the 1199 Panigale R in the race recognises the importance of the UAE to the brand. Just last year one the world’s biggest Ducati dealerships was opened in Abu Dhabi, following on from the launch of the new Dubai dealership in 2010. 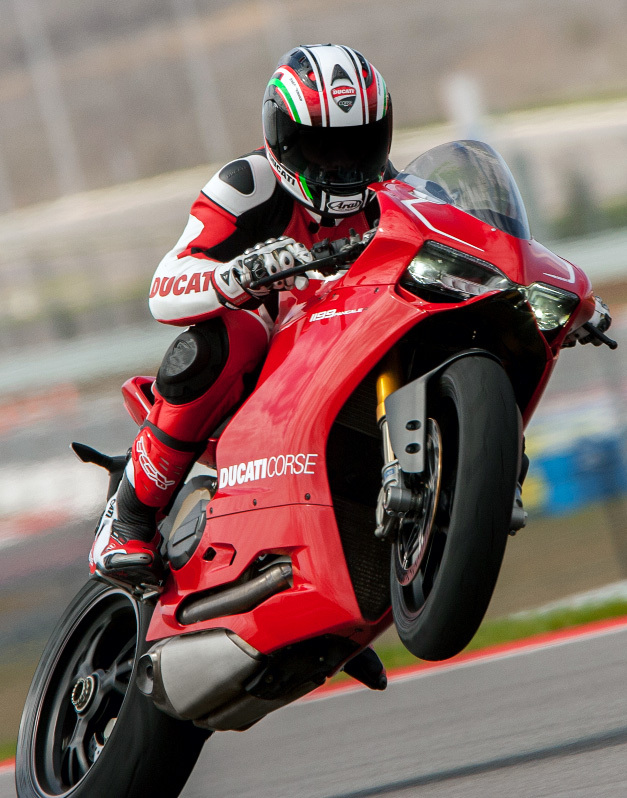 The 1199 Panigale also enjoyed its global launch at the Yas Marina Circuit earlier in 2012. Founded in 1962, Ducati motorcycles are the purest expression of refined engineering, unmistakable design and, above all, passion for bikes. Over the years the Ducati brand has been extremely successful in international racing, winning one MotoGP title, 14 World Superbike titles, eight British Superbike titles and two AMA titles.